Product Photography is not only about an image, it worth a thousand words in the eCommerce business. It belongs to everywhere from a startup to the giant brand like Amazon or McDonald’s. If I ask, what you see at first before purchasing a product? The answer will be a product photo! After seeing the product, we take the decision to buy or not. As a buyer, our mood and feelings vary with product images. Now, if you wish to capture the best product photo for any website or store, you should know the techniques as well. I am showing you the best product photography techniques to rock your business. 1 Read this! Hope, It won’t kill much time of yours. Read this! Hope, It won’t kill much time of yours. Choosing the right camera for product photography is not always easy. For a professional photographer, a perfect camera is very crucial to capture the best quality images. Not necessary you have to buy a high-resolution camera worth thousands of dollars. But if you wish to buy a camera having better quality, you have to look through the number of Megapixels, how the camera performs in both high and low light conditions and the color spectrum. If you get the best lens for product photography, it’s obviously better. If you can’t, have a look at the next line. You can also use the better quality camera of your phone to capture product photos. Just remember, it has to be clear resolution and should be customizable. Don’t forget to use a camera stand when to capture products. In some terms, you may have to use a tripod also. You can move your camera up and down, in and out easily with the help of the stand. Though it costs some expenses, it will work for the future as a good asset. It will make you comfortable in shooting photos. Understanding the camera angle affects the image quality and perfectness. It also creates a uniqueness from others. Have you ever tried of shooting your product photos by hanging in different angles? Yes, you heard the right word. Hanging! Many creative product photographers use this method in different ways. Some use strange angles, and some macro shots to represent the product for an eCommerce site. Make sure, you are capturing more than the needs for your store. Maybe some photos will not cover the proper layout to present your products perfectly. Be careful to choose the right photographer. If you choose the wrong one, your products won’t be appreciated by your customers. Thus, a mistake can make you down in your business. So be sensitive in choosing the right photographer. A descriptive photo has an important part behind this. An amazing selection of background. Focus background of the image that will describe your product to your customers. Have you any background ideas for product photography? In product photography, a white background is appreciated in some specific conditions. Some photographers use white background photography at home as it can be created by own effort. You can put some interesting objects or whiteboard behind the product. If you select the Skyview behind the product, shoot it from a close look. It will present your product in a more attractive way. Keep in mind, don’t overlap the lighting to the products. It may lose the natural look. Best choice of using a background is to add a whiteboard. It can be a better practice if you are a newbie. Think if your products have the most uniqueness from others! How a unique photo appeals to customers? A customer differs your store by the product photos. When they are unique and attractive, click ratio will be increased automatically. You also wish to see something different, right? Focus on details of the product and indicate the uniqueness from the point of a seller. Anything unique selling points of your product you get, show it to customers by your creativity. Use unique place, background, stand, and color variations that will make your products more visible and eccentric. Using phones in product photography is not a common thing now. Its high functionalities of a camera are not less than a camera to shoot a better photo for your product. You can learn from the product photography videos with phone created by the industry experts who are showing various tricks. Many experts suggest to simplify the photo background and keep the camera steady when you are shooting your product photos from the phone. You can find many topics on Google like how to take product photos with iPhone or any other smartphones. So don’t hesitate to use your smartphone if you have not enough capacity to afford a camera. When you shoot a product photo, you have something more to do with it. After effect or editing service is one of the crucial commercial photographic techniques. Many digital marketers are not aware of this issue that impacts on image outlook. Best product photo is not only about clicking a better quality image. It has to be furnished by editing and retouching. You may need to add a cool product background or have to eliminate distractions. Some other common terms like cropping, color correction, layering and adding texts are needed. It’s actually a way to make your products look awesome to your customers. You have the option to choose from various photo editing software for both desktop and phone. Adobe Photoshop, the most used software tool for photo editing can help you to furnish your photo. Many free tools from ImageRetouchingLab, Lightroom, Pixlr are also used by many photographers and designers. You can also use many familiar apps like de-fog or de-noise to make a proper edit of your photos. Try with some free tools at first, then go for the premium. There are a lot of photo editing service providers around the world. If you are not able to do it by yourself, make it done by any of them. Keep in mind that editing is all about presenting your product more professionally and touching to your customers. Make sure to make it best till you upload it to your store. Every product has its different and specific usage to the customers. At first, you have to study the products you want to shoot. Suppose, you are going to click a modern table of a specific brand. You have to know the use of the tool and the presentation should also be thinkable. If you wish to take fashion product photography, you should gather some fashion trends of that product. Your presentation will vary with others for this knowledge. So, does it make any sense of studying the products as a photographer? 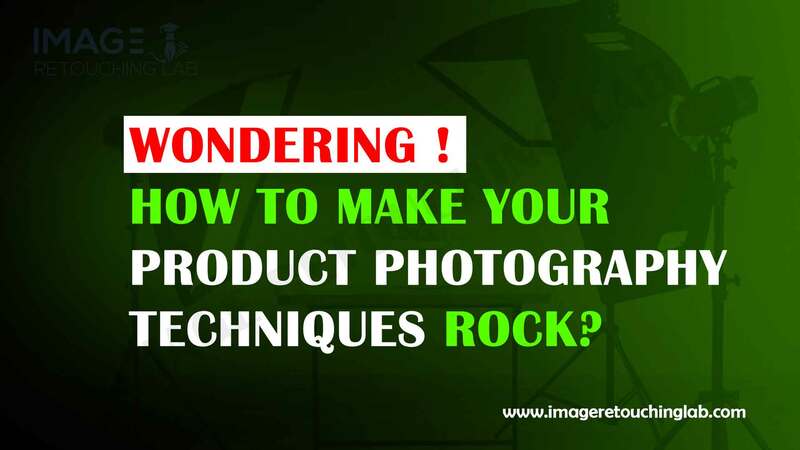 It will help you to make the best result when you have proper product photography ideas. Lighting is one of the key facts in product photography. The total outlook is measured with the application of how you are implementing the lighting process. Use window light rather than a light tent. It will take more objects and time if you use a light tent. It will be more expensive for you to shoot. Many digital photographers believe that image from window light is more interesting and effective than a light tent. Still trying to find a light tent? Then prepare yourself to learn the proper use of the element and set up procedure. Did you ever hear of the gradient reflections on a product? You have to put a diffuser among the light and the subject to get a non-flat look. Have you tried product photography with one light? It’s another way when you don’t have multiple lights or studio. You can also get an outstanding result using this method if you know the proper system of handling the object. Take the right decision whether you should use natural or artificial light. A single lighting setup may not be suitable for every category products. A product like a handbag which is used in outside can be shoot in sunlight. On the other hand, for shooting a mug, you can take it on a table or plate inside the home and focus from light bulbs. Just like these, there are some different techniques to improve product photo quality using lighting. And remember, perfect lighting means less work and less complexity. A perfect photo is not captured always just in one action. You may have to click a hundred times for getting a group of perfect photos. A product needs to be shown in different angles, in different colors and environments. Then how can you finalize photos by clicking once or twice only? If you are shooting a clothing photo, capture it from every angle you can to give every possible corner to your customers to observe. If you shoot the photo with a model, take different poses with the product. Thus, customers will get a clear concept and faith to come back again to your store. So shoot a variety of images of your product and let your customer see in every angle. Another thing to remember, don’t delete photos until you finalize it for your store. Different products need different styles and environments to shoot. You need to take a big shot when you are shooting a product of small size and less weight. They need to be focused clearly to customers. What will you do if you have to capture products of different sizes and weights in a single frame? Make sure you are summarizing the products according to their sizes and weights. It will help the customers to focus the products individually. The proper layouts will be visualized clearly to them. Guess, you are taking photos of a weight machine in different angels. You have to capture the small pieces of equipment for this product which are measured as individuals. Make a plan to set up your studio according to your products from small to large or vice versa. Then click them after configuring your camera for the individuals. Want another interesting technique on this? Ok, scroll down a little bit. A human face increases the product value and shows the perfect usage. Have you seen any product of the wedding category without a human body? The answer will be NO! Can you guess why? We always prefer to see bridal collections or any other products related this with human faces. Actually, we love to see in this way. A toy is always interesting when we see this on a baby’s hand. A customer will be more happy to see this kind of products this way, right? After creating a human face, you must share it to human faces as well. It seems something different. If your product is stuck only on a frame, how people can reach it? To reach it to your customers in all the possible ways use social and professional networks. Share it by the customers as well. How? Make an announcement to provide a gift or discount for those who will share product photos and posts on different platforms. They will enjoy in doing so and help to turn your audiences to customers. We have included a video of an expert who is sharing his thoughts about the latest trends in product photography techniques. Let’s see what he shares. In conclusion, we are showing the way to implement your creativity on clicking product photography. We believe you know better photography than us. But applying in a smart way is the key factor, right? You won’t get a highly decorated product shoot box for shooting the products. You may have to apply some different techniques. Are you ready to apply them to get a better photo? Share your thoughts if have some for our readers. We can discuss them, ok?